Welcome to episode 16. Remember, these podcasts are cumulative, so if you’re just joining us, please start at Podcast #1. Try saying: I love my work. To the nitpickers out there, Yes, there is another way to say this, using the reflexive possessive pronoun свой , as in: Я люблю свою работу — but if you don’t mind, we’ll be using this more intuitive version just for now. My friend is a barrista (a coffee maker) in Starbucks. Now, if a Russian person asks my friend what he does, my friend would say: Я работаю в Старбаксе. I work in New York. Я работаю в Нью Йорке. Here it is in context…As defined by their market capitalization, Exxon Mobil is the world’s largest компания. In English we say “company” and in Russian they say компания. I work for Microsoft. We might also use the word “at” as in: I work at Intel. I work in the company _____. For example: I work in the company Microsoft. Я работаю в компании Майкрософт. I work in the company Intel. Я работаю в компании Интэл. I work in the company Exxon. Я работаю в компании Эксон. Did you use “моя” to rhyme with “компания”? So, remember our two verb patterns so far? But again, the difference is subtle, and they can also emphasize words with their tone, or emphasis, instead of just word order. In my experience, one of the hardest parts for most people who are learning a language is simply staying motivated. As soon as things get tough, their resolve seems to weaken. The doubts creep in, like, “I’ll never be able to speak Russian like that.” And then come the excuses, “I can’t study this week. I’ve got too much going on.” Pretty soon, they stop altogether, satisfied with having learned a few words and phrases. What those people are missing is a powerful, underlying motivation to learn Russian. And that’s what I’d like to talk about for a moment. For me, the motivation was to be able to travel through St. Petersburg and Moscow on my own, completely independently. I didn’t want some tour guide telling me how long I could spend in the DaVinci room of the Hermitage museum. I wanted to be able to rent an apartment, buy my own food, catch taxis and all that…all by myself. So my need for independence when traveling to Russia was my powerful motivation. For lots of guys, the motivation is to be able to talk to their Russian wife or fiance in her own language. They realize how much better it makes them look, that they care enough to learn Russian. And not just to talk with her, but with her family and friends, too. Knowing how to speak Russian also makes guys more valuable. Things aren’t so desparate for Russian or Ukrainian women these days. I’ve been living here in Ukraine now for five years, so believe me, I know. They’re becoming choosier. So speaking Russian will give a guy a huge edge. Another big motivation is the job market. Russia is the largest country on earth and due to their vast oil deposits they stand to become a major force in international commerce. Imagine being able to add the line, “Fluent in Russian” to your resume. It’s a great way to add value to yourself as an employee. So now and again take a little time to think of al the benefits you’ll get by being able to speak Russian. Whether it’s for travel, for romance or for business, knowing Russian will benefit you for a lifetime. I work in the company Dell. Я работаю в компании Дэлл. I’m an American. I live in California. Я – американец. Я живу в Калифорнии. Say: I work in the company Google. Я работаю в компании Гугл. No. I’m not working now. Нет. Я не работаю сейчас. So in English we say ‘bank’ and in Russian it’s банк. I’m new to this company, so I just have a small cubicle. But one day I hope to have my own офис. Say: I work in a bank. Did you remember to add that “yeh” sound at the end of “bank”? Do you work in a store or in an office? Ты работаешь в магазине или в офисе? I’m now in the bank. I’ll have coffee. Whereas what will you have? Я буду кофе, а что ты будешь? I live in Maryland. Where do you live? Я живу в Мэриленде. Где ты живёшь? I want pizza. And what do you want? Я хочу пиццу. А что ты хочешь? I work in the company Sony. Я работаю в компании Сони. That wraps up today’s podcast. In the next one, we’ll add a new verb pattern that’ll let us say things like, “She lives in Minsk,” or, “He works downtown,” and so on. That’ll really come in handy and expand your vocabulary being able to talk about other people. And we’ll also talk…about talking. Hope everything is well, and you are staying safe in Ukraine! I work from home. So what would be the correct Russian way of saying “I work from home”? Yes, we moved to the western part of Ukraine and all is quiet here on the western front. An easy way to say: I work at home. I was curious as to why we learned that the “oo” sound in “pizza” changed the world to “pizzU” when something was done to it – with the new “yee” sound added, does that make it “pizz-yee?” I’m a tad confused here as I remembered the rule beforehand. since 2010, I’m visiting Russia twice a year for about a week. I’ve started several attempts to get into the language – just to be autonomous as I navigate through Moscow or St. Petersburg. I can read Cyrillic at a decent pace and have a vocabulary of some hundred basic words. But the language learning attempts always got me frustrated after a few days because I didn’t see real progress. I’m now going through your podcasts since two and a half weeks and I am truly excited about how things build on each other – awesome! The transcripts are also very helpful as a review tool. I have a Russian student assistant and I meet her once a week and read out from the transcripts, so she can correct my pronunciation. 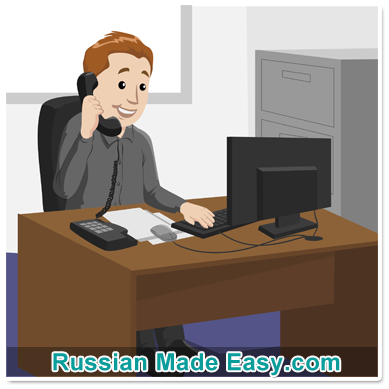 Your “Russian Made Easy” really makes me having fun with learning Russian. Anyway, thanks for posting. 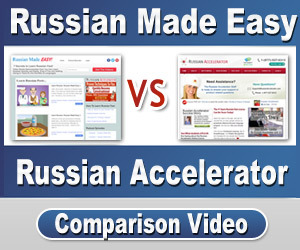 I hope to welcome you one day to my Russian Accelerator video course.